The Gupta dynasty and its successors had declined by the end of the 6th century and several changes took place in the Deccan and Southern India. By the time the Vakatakas had collapsed the early Kaluchuris dynasty established itself around 520 A.D and flourished till 600 A.D. The Kaluchuris are noted for Pasupata Saivism, a religious movement in the Deccan and South Asia. They excavated the Jogeswari caves,Mandapeshwara,Elephanta and the Dhumar Lena at Ellora. They were overtaken by the Western Chalukyas of Karnataka. 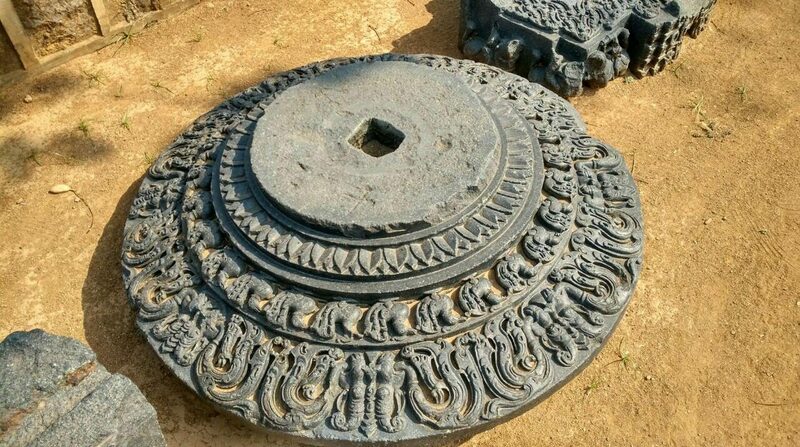 The Kadambas of Banavasi ruled in South Karnataka and were also overtaken by the Western Chalukyas, who were Dravidian and ruled from Badami (ancient Vatapi) and called Badami Chalukyas. Their ruler Pulakesin I fortified the area of Badami in 543 A.D. Pulakesin II was its most notable ruler. He defeated Harsha on the banks of the Narmada. He expanded the kingdom to the northern limits of the Pallava kingdom. However in 642 A.D Pallava king Narasimhavarman occupied Badami for some time. Pulakesin died fighting. However the Chalukyas regained power under Vikramaditya I. Later Vijayaditya (696-733) ruled for 37 years and built many temples. Vikramaditya II ruled 733 – 744 A.D and was victorious over Pallava king Nandivarman II. He was a kind ruler, made temples at Kanchipuram too. Thus this early Chalukyan dynasty ruled most of the Deccan for 200 years; from mid 6th century to mid 8th century. They were overthrown by the Rashtrakutas.This dynasty is remembered for it rock-cutting sculpture and later structural temples. The rock cut tradition is found at Aihole and Badami in Karnataka. Chalukyan art of ancient India reaches a classical zenith at the group of monuments at Aihole in the present state of Karnataka in southern India. An amazing example of rock cut temple architecture built by the Chalukyas datable to 550 A.D. is the Ravana Pahadi. These Chalukyas were ware called the Early Western Chalukyas by historians. The Deccan became an interface between the upper north and south below in the Indian peninsula. The Ravan Pahadi cave has a simple facade with two dwarapalas and dwarves. The cave has a central mantapa (hall) with shrines by its sides. At the back end is a linga within a sanctuary. The mantapa is at a lower level than the shrines and sanctuary. The cave walls and ceiling including the corners of the main mandapa or hall have superb sculptures. A multi armed representation of Lord Shiva as Nataraja along with the saptamatrikas . Legend has it that the saptamtrikas were created during his battle with Andhakasura. The figures are slim and their garments have striations which are incised on stone. The cave has a figure of Durga as Mahisasuramardini depicting her with her with one left hand and folded leg crushing the bull. She holds her weapons including the trident or trisula which is very prominent. Mantapa , Ravana Pahadi cave temple,6th century, Aihoḷe,Karnataka. Linga,Ravana Pahadi ,6th century,Aihole, Karnataka. Nataraja, Ravana Pahadi cave temple, 6th century,Aihole,Karnataka. Mahisasuramardini, Ravana pahadi Cave temple, 6th century,Aihole, Karnataka. Durga temple at Aihole has an apsidal and oblong plan and is part of a fort or durg, hence its name Durga. It was built during the late 7th and early 8th centuries by the Early Western Chalukyas. There is a circumbulatory passage around the temple having pillars,some with sculptures.. There is an entrance area, a mandapa or hall and an inner shrine. The inner shrine has a narrow circumambulatory path. The temple has a small porch approached by two staircases. The inner wall of the temple has many sculptures. ; Durga as Mahisasuramardini having eight arms. A shikhara is present on the temple’s east-side over the shrine. The temple might have been dedicated to Lord Vishnu as many of his avatars are carved on the temple like Varaha and Narasimha. Celestial couple,ceiling, Durga Temple,6th century, Aihole,Karnataka. This entry was posted in Aihole, Ancient Indian history, art history, asian art, Badami, Chalukyan art, Deccan history, Durga and tagged Aihole, art history, Badami, Chalukya art, sculpture on July 6, 2017 by historyreads.